Economics 2 Summary (Mankiw) This is a summary of Economics by Mankiw & Taylor. The summary contains diagrams, as well as the most important terms and explanations in italics and bold for a clearer view. The summary contains only the chapters of the exam requirement. Enjoy reading, learning and good luck with your exam! 'Economics' by Mankiw & Taylor - Summary (Questions for Review answered) - Ch. 3-14; 20-24; 30-33 Summary of the book 'Economics' (3rd edition) by N. Gregory Mankiw & Mark P. Taylor - for chapters 3 to 14, 20 to 24 and 30 to 33. I've answered the Questions of Review after each of these chapters with relevant definitions, graphs and explanations. Covering topics as: price elasticity, theory of consumer choice, perfect competition, taxation and deadweight loss, behavioural economics, market failure, monopoly, GDP, productivity, unemployment, savings, financial system, business cycles, Keynesian economics, IS-LM analysis, aggregate demand and aggregate supply, monetary policy, fiscal policy. This summary was written in the framework of the PPLE course 'Economics Markets & Organisations 1' and is optimized for both its Midterm and Final Exam - but this summary can, of course, also be used in preparation for other courses. 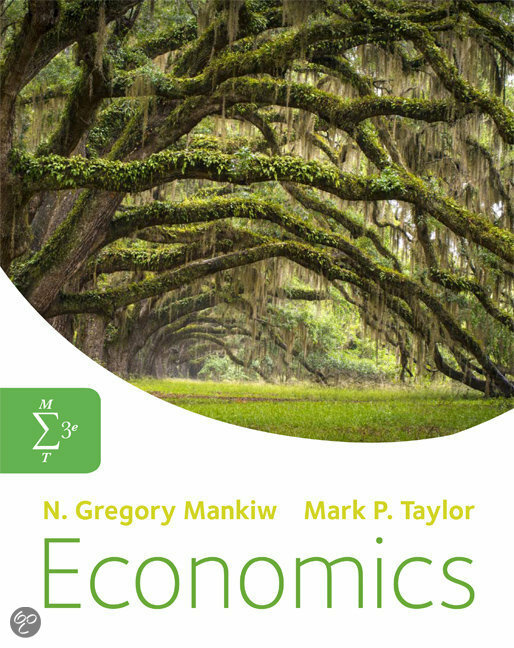 Book: N. Gregory Mankiw and Mark P. Taylor - Economics, summary Y2Q1 A summary of the subject Economics in Quarter 1 in grade 2 of the International Business and Management Studies program at Avans University. The book used is' N. Gregory Mankiw and Mark P. Taylor - Economics. Samenvatting Economie Economics (Mankiw) H1, H3, H20, H21, H22, H24, H26, H27, H28 in het Nederlands Detailed summary for economy of the book Economics Mankiw (3rd edition) in Dutch. The summary contains chapters 1, 3, 20, 21, 22, 24, 26, 27, 28. Summary Economics - Chapter 1 till Chapter 16 excluding Chapter 12 Summary from Economics by Gregory Mankiw and Mark P Taylor. This summary includes the Chapters 1 till 16 excluding Chapter 12 and is written for the minor wo-doorstroom from the Hogeschool Rotterdam to the Erasmus University Rotterdam. The subject which gives an exam about this document is the subject Micro-economie. Book: N. Gregory Mankiw and Mark P. Taylor - Economics, summary Q2 Een samenvatting van het vak 'Economics' in kwartaal 2 van de opleiding 'International Business and Management Studies' te Avans Hogeschool. Het gebruikte boek is 'N. Gregory Mankiw and Mark P. Taylor - Economics'. Economics ch1,3,20,21,22,24,26,27,28, Good summary of the book ''Economics'' written by Gregory Mankiw and Mark P. Taylor this year of the chapters 1, 3, 20, 21, 22, 24, 26, 27, 28. Economics 1 Clear summary of economics in only 13 pages! Economics 1 Summary (Mankiw) With this summary, I passed my first-year economics exam. The summary contains some diagrams, as well as the most important terms and explanations in italics and bold for a clearer view. The summary contains only the chapters of the exam requirement. Enjoy reading, learning and good luck with your exam! Economics 2 (year 2) complete summary Complete summary of Economics 2, based on the book of Gregory Mankiw (2nd edition ebook, but converted to the chapters of edition 3, which are Elasticity and Its Applications, Supply, demand and government policies, Consumers, Producers and the Efficiency of Markets, The Theory of Consumer Choice, Background to Supply: Firms in competitive markets, Firm’s Production Decisions, Market Structure I: Monopoly, Monopolistic Competition, Oligopoly, Factor Markets: The Economics of Labour Markets, Externalities and Market Failure. Economics Chapter 1 These are the notes for the very first chapter of the Economics book that is used for uni of Aberdeen. The book is the 4th edition of "Economics" by N. Gregory Mankiw and Mark P. Taylor. The notes include the most important things that should be remembered from the first chapter. I hope it helps as much as it helped me! Macroeconomic Revision Notes Macroeconomics Revision notes are all you need to prepare for your exam. These notes offer a summary of the whole Macroeconomics term. Save your money and time. Be smart! Sur cette page, tu trouveras des résumés, des guides de révision et bien plus de livres de révision Economics, écrits par Mark P. Taylor & N. Gregory Mankiw. Les résumés sont écrits par les étudiants eux- mêmes, ce qui te donne les meilleurs renseignements sur ce qui est important de réviser dans ce livre. Les sujets tels que economics, Economics, HBO, IBMS, Economie, ECONOMICS, demand & AVANS seront traités.